Recently one of my friends lost his unrooted Android phone files mistakenly as there is not enough memory in his phone to storing new data files. But he needs those files very badly as those files are so important for him. He came to me and asks me to recover those files from his unrooted Android phone. So based on this issue, I would like to explain the perfect solution for this as a blog post and for this RapidTricks is the best place for me to explain this tip or tricks whatever you want to call it. In today’s world, almost 80% market covered by Android users and a huge amount of android users having this issue of data loss, So we have mentioned some issues below you need to check out them and if you are facing the issues given below, then you need to follow our step by step solution to recover deleted files android unrooted without pc. You may delete android apps again and again by chance because of less memory. Accidently delete your data with unwanted clicks. Your phone denying recovering all old files. If you are facing above issues then you need to check out below process to recover deleted files android internal storage unrooted and once you follow below process you will never need to ask how to recover deleted files from unrooted Android. You will need to download android data recovery software that can easily restore all your lost data and deleted files from your unrooted android phone or tablets on your computer. You can also recover deleted files from the internal storage of your Android Phone as well as external storage or Sd card of your Android Phone. Here are three software’s we found on the web which helps you to recover deleted files back. By these software’s you can get your files, Photos, Videos, Audios, APK Files, etc. from unrooted Samsung, Nexus, LG, HTC, Motorola, Lenovo and other phones. You can start with the trial version to discover the features by yourself. First, you need to download and install one of Android data recovery software on your PC or Laptop and run the software. Connect your Android device to your PC via USB cable. 2. Enable USB debugging with the help of notification bar section. If you don’t have access to USB or your USB cable is damaged then you can try Wi-Fi connection mode which can be easily connected with your Wi-Fi Router and your phone. 3. You need to follow on-screen commands to turn on USB storage on your Phone. Once the Android data recovery software detects your phone then you need to click start to scan your phone for lost data. 4. Once the scanning was done, you can check the files and start to recover files from your unrooted android phone. Simply click on “Recover” button. By following above steps, the deleted files will be recovered and you can save them on PC. Once you make some space on your phone by SD card or deleting files from your phone, You can transfer them on your unrooted android smartphone. 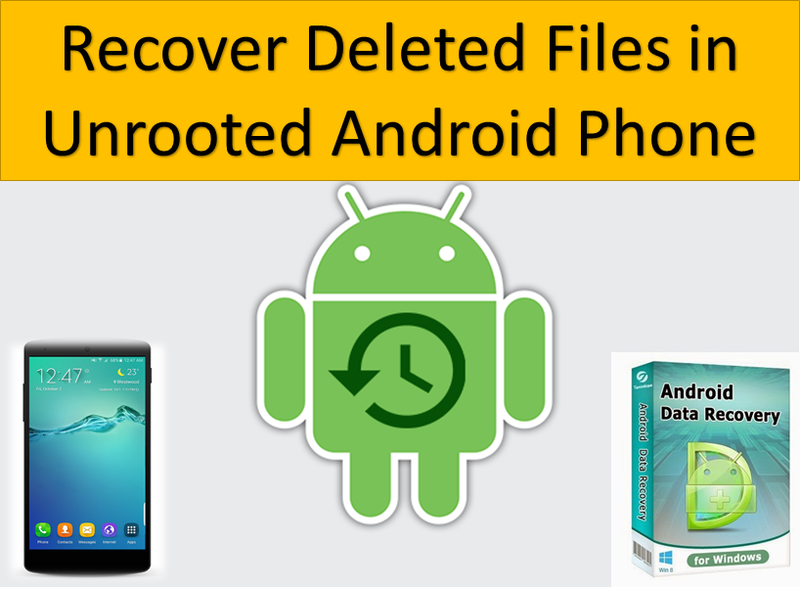 So this is the complete method of Recover Deleted Files Android Unrooted, If you like the article then please don’t forget to share it.